This month on Open Apple, we sit down with Ken Gagne and Andy Molloy of Juiced.GS, the longest running continuously published Apple II magazine (that you can still get in your mailbox to this day!). Juiced.GS is in its 23rd year, which has to be a record for magazines of almost any type. Ken and Andy talk about the bloodless coup of the magazine, the long history of same, where things are headed, and why they hates trees. Meanwhile, Quinn and Mike chat about FPGAs, nuclear weapons, and BBSes. What do you do when you need a mathematically provably correct piece of hardware to verify nuclear weapons compliance? Why, you grab your Apple II, of course! Duh! Here’s a time sensitive news item that didn’t make it into the show- vote for Nox Archaist and Lawless Legends for your favorite Ultima-inspired indie games of 2017! Stay tuned for a Tech segment where we follow up on last episode and go even deeper on fast IIgs graphics. There’s always more to know about the intricacies of squeezing performance out of this unique and beautiful machine. More information on everything discussed in this episode, after the jump. We’re baaaack! Sorry for the unscheduled hiatus folks, but your intrepid hosts had some family matters to attend to. This month on Open Apple, we sit down with Seth Steinberger of 8-bit Weapon. We talk about their new album Class Apples, which was made entirely on an Apple II. Yes, every sound on the album is generated by real Apple II hardware with no add-on cards. Apple IIs can make good sound with the right software and in the hands of a talented musician. After the amazement of Class Apples wears off, we get into Seth’s background with Apple IIs, how he got interested in electronic music, how 8-bit Weapon came to be, and where they’re headed next. We touch a little bit on his work as the main artist on the upcoming RPG Lawless Legends, and Seth explains how much better keyboards are as compared to proms. Furthermore, we all agree that the primary value of the internet is to find pictures of Devo. Michelle wasn’t able to be on the show, but you won’t want to miss the story of how she got to work with Mark Mothersbaugh. Mike and Quinn then get into augmented reality, alternative operating systems, and of course Richard Garriot. Can’t have an Apple II show without mentioning Richard Garriot. Stay tuned to hear about accelerator control, new magazines, and making your own memory cards. Lastly, Quinn goes deep on how to program fast graphics on the notoriously “crippled” Apple IIgs. Yes, you can do big beautiful sprites at high frame rates. Learn all about the deep dark secrets that the best games and demos used. Help keep the Garage Giveaway running at KansasFest! Donate here to keep it a thing. It’s one of the greatest services the Apple II community has, and we’re going to lose it this year if we don’t get donations. This month on Open Apple, we sit down with KansasFest committee member and lifelong Apple II user Peter Neubauer. We talk lots about the upcoming KansasFest, of course, but also Peter’s own experiences with the machine. He has a passion for Logo, and a special place in his heart reserved for the Apple IIc Plus. I think many of us can relate to that. We talk KansasFest, KansasFest, and more KansasFest. Then we talk about KansasFest, followed conversation about a fruit-based retrocomputing conference that takes place in Missouri every July. We have plenty of regular news to catch up on as well, so stay tuned for updates from 6502 Workshop, NinjaForce, and more. We have graphics talk, Bluetooth talk, and exciting new accelerators from the mad Bulgarian. It’s already too late to register for KansasFest, but if you’re going to be there, make sure to say hi! We love to meet our listeners. This month on Open Apple, we share an excerpt of an interview with John Brooks, courtesy of Juiced.GS. John talks about how and why he updated ProDOS, and his experiences getting back into the community. Tune in to hear Quinn lose 20 years of time perception around the Tiger Learning Computer, then pretend to know stuff about power supplies. Meanwhile, Mike waxes nostalgic about high school computer labs and tries to unload his excess Apple IIs on unsuspecting community members. We try out a new segment this month, and we hope you like it! No spoilers- you’ll just have to listen and see what we’re up to. Open Apple #54 (December 2015) : Year End Roundtable! This month on Open Apple, we round out the year with our annual tradition of sitting around a virtual table with some friends of the show, discussing whatever comes to mind. Mike and Quinn are joined by Randy Brandt of Beagle Bros fame, Charles Mangin of RetroConnector, and some guy named Carrington Vanston. We talk about connecting old things to other old things, connecting old things to new things, and how to pluralize German surnames. Mike manages to make several Apple III references, Carrington imagines nonexistent 8-bit games, and The Third Apple Guy is discussed at some point. It’s a deep, intellectual examination of all things Apple II. Stay tuned to hear why Quinn’s mom hoards peoples’ IIGSes for some reason. You won’t want to miss a moment. Also, Quinn makes a 65C02 joke that nobody laughs at. You’ll know why. This month on Open Apple we sit down with David Schroeder, author of classic Apple II games such as Crisis Mountain, Dino Eggs, and Short Circuit. We talk about the randomness of our passionate brand-loyalty, the logistical realities of early Apple II development, and the magical era of “one-person, one-game”. We get into a lot of the technical details of Crisis Mountain and Dino Eggs, so you might pick up some tips for your own Apple II projects! David also has great memories of the economic and design realities of the time, where everyone was scrambling to figure out what a computer game was, and what players really wanted. Game developers are still fighting that battle, but at least we have a definition of “video game” now. We’re sharing David’s games in the show notes below, with his permission! In exchange, he asks that you patronize, share and support Dino Eggs: Rebirth. After that we jam through some quick news, bask in the fallout (see what I did there?) of the GEOS episode, and we get down and dirty with rodents. Do you have the GS with the bigger Em Bees? Trust us, you want the bigger Em Bees. You might notice that we’re continuing to tighten up the show. Let us know how you feel about this trend in our show length! Do you like the shorter episodes? Miss the epic three hour monsters? Email us at feedback (at) open-apple (dot) net. We have social media too, but we can never remember which ones. This month on Open Apple, we sit down with Beagles Bros Randy Brandt, Mark Simonsen Tom Weishaar, and Alan Bird. We share stories of Beagle’s development, poke lots of fun at each other, and check in on where everyone is now. We spread the love for Oz KFest with Andrew Roughan, and amazingly resist the urge to make any upside-down jokes about Australia. Mike and Quinn are trying to be bigger than northern-hemispherism, and they like to think they’ve grown as people as a result. 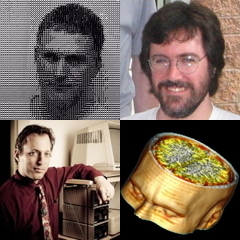 We talk brain-imaging, we talk helicopter piloting, and we spread more IIgs love than usual. We search for amazing things, and sometimes we find them. Join us for another great month of Apple II brouhaha. More information on everything discussed in this episode after the jump. At the dawn of 2014, Open Apple engages in its annual tradition of reflecting on all that has transpired in the Apple II community in the past year. Ken Gagne moderates a panel of Mike Maginnis, Andy Molloy, Ivan Drucker, and David Schmenk to look at topics in news, emulation, hardware, software, conventions, and publications. Popular themes include the Raspberry Pi, the S-Prize, social media, JSMESS, the Jobs film, and KansasFest 2013. Click past the jump for links mentioned in this episode.